The picturesque village of Tighnabruaich sits on the shores of the beautiful Kyles of Bute – a National Scenic Area – and is a popular location for sailing and yachting. Take a trip on the Paddle Steamer Waverley, the world’s only remaining sea-going paddle steamer, enjoy a spot of fishing or wildlife watching, or just soak up the coastal views. Acharossan House is a beautifully presented period house, tucked away amongst 1200 acres of farmland. It's a sensational all year round holiday destination, with fabulous entertaining space, ideal for larger parties. Private tennis court. With 5 bedrooms and 5 bathrooms, it comfortably sleeps 11. 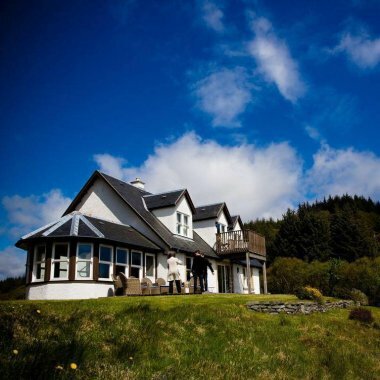 Fabulous Holiday Houses set in Ormidale Estate in magnificent scenery on Scotland’s West Coast with swimming pool, hot-tubs, sauna, tennis court and games cottage.